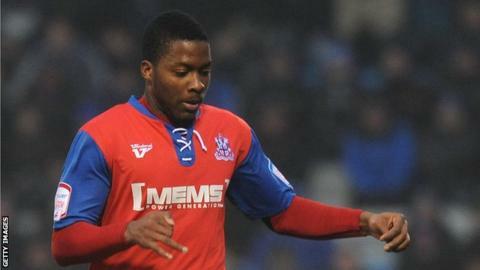 Gillingham substitute Antonio German scored in stoppage time to earn his side a draw at Bradford City. The Bantams deservedly took the lead in the 56th minute thanks to an own goal from defender Leon Legge, who turned in Andy Halliday's curling shot. The home side almost added a second on 77 minutes when substitute James Hanson's shot beat the keeper Stuart Nelson but struck the post. But German denied Bradford victory when he turned in Legge's header. Match ends, Bradford City 1, Gillingham 1. Second Half ends, Bradford City 1, Gillingham 1. Attempt missed. Mark Yeates (Bradford City) left footed shot from the left side of the box is close, but misses to the left. Goal! Bradford City 1, Gillingham 1. Antonio German (Gillingham) right footed shot from the centre of the box to the centre of the goal. Corner, Gillingham. Conceded by Mark Yeates. Attempt missed. Danny Kedwell (Gillingham) right footed shot from very close range is too high. Foul by Antonio German (Gillingham). Attempt saved. James Hanson (Bradford City) right footed shot from the centre of the box is saved in the centre of the goal. Attempt missed. Doug Loft (Gillingham) right footed shot from outside the box misses to the left. Substitution, Bradford City. Christopher Routis replaces Billy Clarke. Attempt saved. Danny Kedwell (Gillingham) header from the right side of the box is saved in the top centre of the goal. Substitution, Gillingham. Danny Kedwell replaces Bradley Dack. Andy Halliday (Bradford City) wins a free kick on the right wing. Foul by Adam Chicksen (Gillingham). Attempt saved. James Hanson (Bradford City) right footed shot from the right side of the box is saved in the bottom left corner. Delay in match James Hanson (Bradford City) because of an injury. Corner, Gillingham. Conceded by Gary Liddle. Substitution, Gillingham. Jermaine McGlashan replaces Kortney Hause. Attempt saved. Mark Yeates (Bradford City) left footed shot from outside the box is saved in the centre of the goal. Corner, Bradford City. Conceded by Kortney Hause. Attempt blocked. Billy Clarke (Bradford City) right footed shot from the right side of the box is blocked. Adam Chicksen (Gillingham) wins a free kick on the left wing. Own Goal by Leon Legge, Gillingham. Bradford City 1, Gillingham 0. Attempt missed. Andy Halliday (Bradford City) right footed shot from outside the box is too high. Hand ball by Doug Loft (Gillingham). Second Half begins Bradford City 0, Gillingham 0. First Half ends, Bradford City 0, Gillingham 0. Corner, Bradford City. Conceded by Jake Hessenthaler. Corner, Bradford City. Conceded by Stuart Nelson. Corner, Bradford City. Conceded by Leon Legge.